Archbishop Kwashi has survived three attempts on his life. He can speak first hand of God’s grace and power, experienced in the most difficult of situations. The province of Jos covers North Eastern Nigeria, which has had numerous outbreaks of religious violence where Christians have been targeted by Islamist militants. The Archbishop has been outspoken and openly critical of the press and the authorities whenever he has witnessed lies and injustice. Such courage has come at a price, for Archbishop Kwashi who has been personally targeted and his wife, Gloria, and son have been badly beaten. On that occasion, Gloria was dragged through the streets to the diocesan offices. She was left blind until an operation in Texas restored her sight. Almost 18 months later, as the family prepared to celebrate Gloria’s recovery, four young men arrived to kill the Archbishop, who immediately fell to his knees to pray. “Man of God, we have come for you,” they said. “This is not the time for prayer.” They took him outside but stopped to negotiate the price of his life. One of them screamed. “I’ve changed my mind. Let’s take him back inside and kill him there.” It never happened. They took what money Gloria could find and disappeared into the night. That’s something of what contending for the faith has meant for Ben and Gloria Kwashi. 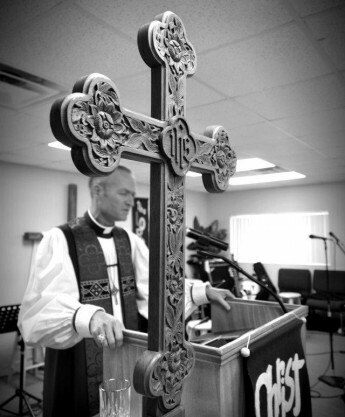 CANA East is one of four missionary dioceses in the Convocation of Anglicans in North America. Home to 31 congregations and almost 70 ordained clergy, CANA East is committed to planting and building biblical missionary Anglican churches across North America. All are welcome to attend Synod and meet Archbishop Kwashi. This is the Christian gospel in a sentence: come and see for yourself and now go and tell someone else about it. In the longer ending of Mark’s gospel, Jesus commissioned the disciples to go into the whole world, preach everywhere, believe and baptize. Life and death is at stake because if someone does not believe in the risen Christ, they are lost. And so, obeying the commission of the risen Lord, the disciples go out with a pile of evidence, with hearts full of experience and the risen Lord Jesus went with them everywhere they went.